Coming soon to Bradford on Avon’s Library, as part of the Wiltshire at War series, there will be an exhibition exploring how the First World War shaped lives and landscape across Wiltshire’s towns and villages between 1914 and 1918. Alongside the panel exhibition will be a display case with medals and medallions, as well as photographs of the Red Cross Hospital at Avoncliffe. For younger visitors, and older ones, there will be dressing up clothes of the period, and a handling box of period replica items. 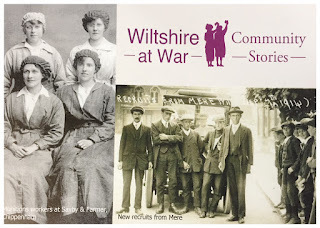 The exhibition which is on loan to Bradford on Avon Museum runs from Saturday 5th August to Saturday 26th August. Visit it during library opening hours and on Sunday afternoons between 2 – 4pm. On Monday 21st August, staff and volunteers from Trowbridge Museum will run a 1 day event for children and families in Bradford on Avon’s Library Meeting Room. The event takes the form of a WW1 recruiting and VAD Nursing (Voluntary Aid Detachment) recreation. Boys are recruited as soldiers and the girls as nurses, and they will be given a short talk on WW1. The boys will be drilled in marching and the girls in bandaging. Children will be able to dress in period uniforms and have their photographs taken against a period background.